Randy Brown def. Matt Dwyer at UFC Fight Night, Newark, New Jersey. Photo Courtesy of Brown’s Facebook Page. A UFC newcomer joined us live on the air Tuesday, February 9th, 2016. Randy “Rudeboy” Brown came on to Carroll’s Corner MMA Podcast and discussed his UFC debut, meeting Dana White, and more. 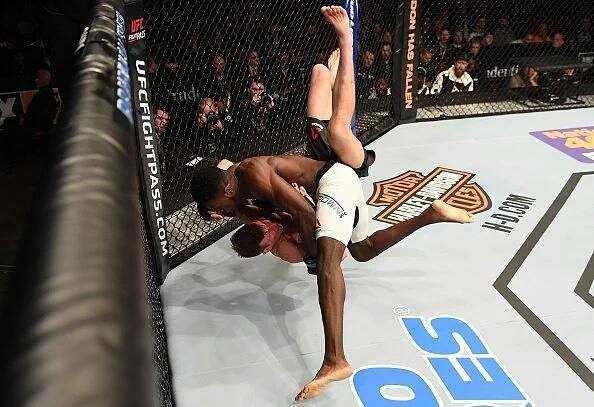 Brown improved his record to 7-0 overall and now 1-0 in the UFC after earning a unanimous decision victory inside the octagon at Newark, New Jersey. Brown is a welterweight that was discovered by the UFC president, Dana White, while he attended a Ring of Combat show in Atlantic City, New Jersey. While President White was there, Brown impressed him with his finish victory over a fighter out of Matt Serra’s gym. On their show, ‘Lookin’ for a Fight’, Brown was greeted by Dana White after his bout in the locker room. Brown’s next fight is yet to be scheduled, but there are many fighters in the welterweight division that Brown matches up well against. He’s a fun, exciting fighter, expect to see him often within the next year. Interested in following this rising UFC star on social media? 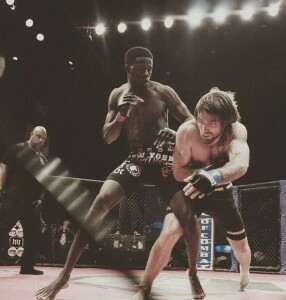 Follow him on Instagram @TouchNgo_ and on Twitter @TouchNgo_ – On Facebook fans can find the UFC welterweight by typing Randy “Rudeboy” Brown in the search. Be sure to also follow My MMA News on social media @MyMMANews and My MMA News Reporter Kyle Carroll’s podcast by following him on twitter @jiblitz77. Tune in every Monday evening at 7 p.m. EST to listen to Carroll’s Corner MMA Podcast. Next week will be episode 9. We are still waiting for our guests to be confirmed, but be sure to tune in! Randy Brown of the UFC live with us!